My husband almost didn’t believe me when I told him that this Fettuccine Alfredo was low fat. With no heavy cream, and only 1 tablespoon of butter, you may be wondering how this Alfredo sauce can taste so good? Well, the secret is 1/3 less-fat cream cheese. Cream cheese, combined, with a little flour, minced garlic, skim milk, and Parmesan cheese makes for a wonderful, low-fat sauce with only 13.5g of fat and 399 calories versus a whopping 65g of fat and nearly 1,000 calories in traditional Fettuccine Alfredo. As a little kid, I was the biggest fan of Fettuccine Alfredo and would order it every time I ate at The Olive Garden, Macaroni Grill, or Carrabba’s (my favorite Italian food restaurants growing up). 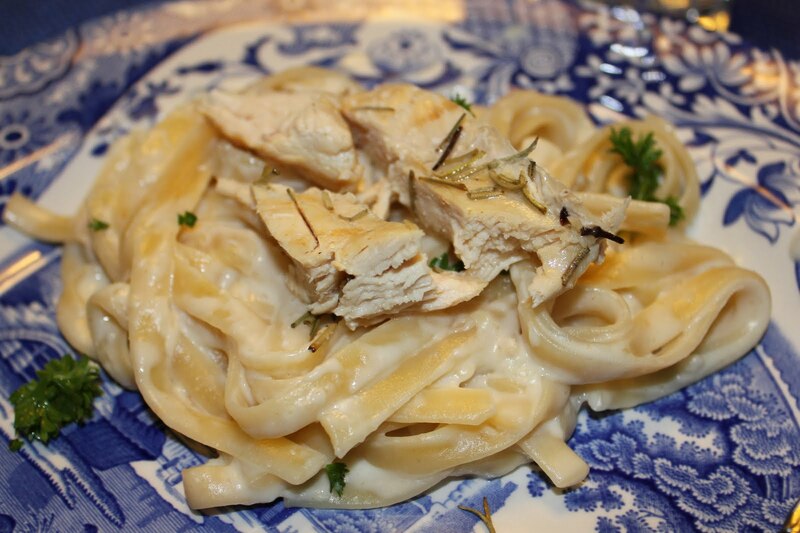 Once I realized how many calories were in Fettuccine Alfredo, which wasn’t until I was a senior in high school, I ceased to order my favorite Italian dish for fear that I would “get fat”! Just last week, my sister informed me that she made this low-fat Fettuccine Alfredo recipe from Cooking Light for her boyfriend, Colby. I was shocked because my sister had never ordered Fettuccine Alfredo from a restaurant in her life, and she told me that her recipe happened to be very good! Well, I had to give it a try, and a few days later my husband and I sat down to an old Italian classic that was “good for us.” I added grilled chicken to the recipe by sauteing the chicken in a cast iron skillet with olive oil and a little rosemary. Simple, and a perfect addition of protein to my favorite pasta recipe. Optional: grill or saute’ chicken in olive oil and a little rosemary until chicken is done, and no longer pink. Meanwhile, melt butter in a medium saucepan. Add garlic; stir for one minute, and then stir in flour. Next, whisk in the milk, and cook for 6 minutes, stirring constantly until mixture thickens. Add Parmesan cheese, cream cheese, and salt, and whisk together until cheese melts. Toss sauce, with hot, cooked pasta. Serve, topped with extra Parmesan cheese, parsley for garnish, and sliced grilled chicken. 1. Melt butter in a medium saucepan over medium heat. Add garlic; cook 1 minute, stirring frequently. Stir in flour. Gradually add milk, stirring with a whisk. Cook 6 minutes or until mixture thickens, stirring constantly. 2. Add 1 cup Parmigiano-Reggiano, cream cheese, and salt, stirring with a whisk until cheeses melt. 3. Toss sauce with hot pasta. Sprinkle remaining 1/4 cups Parmigiano-Reggiano cheese and chopped parsley. Garnish with black pepper, if desired. Serve immediately. 7 Responses to "Fettuccine Alfredo"
Is this the same that I made for Colby? Yes, moron if you read the above post you would see that. My time is more important than to read this- anyways how many of these posts have you read? I copied this recipe for all the girls in my office. We were looking for a lite Alfredo sauce. Yay I hope they all like it!